I was hoping to start a conversation about fabric/textile armour and arming garments. I realize that the terminology surrounding these items is varied and open to some debate and discussion. However, I thought it might be good to at least try to identify a few things seen in historical artwork by applying names to these items. In some cases, the images may be vague or a particular item might fit more than one definition. This is the type of discussion I'm trying to prompt. I've added arrows with letters (A-T) to make discussion easier. When discussing a specific garment, please refer to it by letter. Some items may very well not be considered arming garments at all. This is worth noting, too. B,C,D,E,F,G,I,J,K,L,M,N all seem pretty straight forward as Gambesons, some different stitch patterns but armor for combat. A seems to be a Tunic more than padded armor to me, by the way, the art work on the first picture is really exceptional when you look close, a very good artist did this. Is it a miniature? H maybe a coat of plate by the look of it but might be a gambeson as well, with some kind of an armored skirt and a particularly fetching sleeves top :-) interesting guy here my guess is he is upscale compared to the others in the group. OOps I got to run more later. Had to run to fight practice. Now back to our previously scheduled program. O looks as if it is over a mail shirt or the piece may have a mail collar. This may well be over hard armor as well but that is hard to judge from such art work as the actual figure maybe just a 1/2 inch high or less and we ar trying to distinguish what is underneath by shape and hang. P,Q,R all seem to be Jerkin style arming jackets with padding for additional protection/padding if worn under armor. Though these may well have been strictly fashionably cut pieces they are designed to also wear under armor. 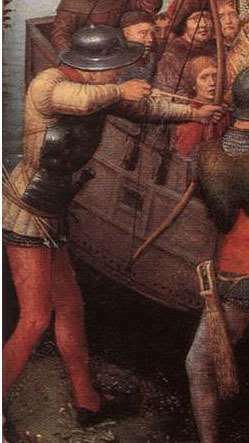 The Archer specifically has the breastplate worn over the piece. S,T see to be more tunic orientated as depicted though S may well have some padding or integral plates as it seems stiffer and bulkier in appearance. 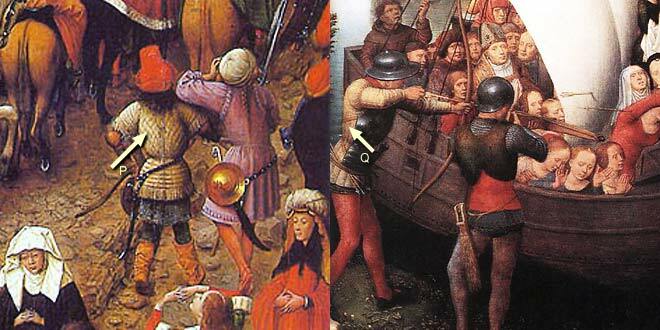 In contrast the figure at the far left of the first picture and the figure standing next to N both have obvious tunics of simple cut and worn over what ever protection maybe under the pieces and are probably not relied on for any protective qualities. Nathan you've been posting some pretty thought provoking stuff recently! I think that most of these are, as Craig states, typical gambesons, but several strike me as not falling in that catagory. O for instance is too form-fitting and elaborate to be a typical arming gambeson. Maybe something diferent? Nice post though, I'll see if I can find a bit more later? I'd say that most of these garments aren't cloth armours at all. Garments A - O are late 14th - early 15th century jupons, worn over plate armour. I have no idea how thick or protective they were - I believe they're more of a fashion thing, hiding the ugly bright steel breastplates (before the fashion and tastes changed to "allwhite"). P, Q and R are 15th century jacks of various designs. Substantial cloth defences, made of multi layered cloth (usually 20 or more layers of linen). S and T are 13th century gambesons. Dotted lines show stitching, not studs. By the way they're folding, they don't seem very thick or stiff. They also seem to sleeveless, with another padded garment with long sleeves underneath - or the sleeves are attached to the garment so that it seems like that. I spent all morning trying to remember that word as I was going to say that I was lumping the over and under worn garments of padded quilted garment together. It was, of course, a different idea behind each but I think the basic format and style were very much the same. A layer of shock absorbtion between the incoming attack and your body. Now in the context of Nathan's discussion one probably should differentiate the difference as intended use is a clear distinction but as fars as I have been able to see from the items and research I have looked at construction seems to be very similar and it is probably a size issue in the transition period. Not to make things any more complicated but i think one type is left out here (maybe it was ment that way and im just creating chaos..) but anyways - The arming doublet - worn underneath breastplates/brigandines, with points and thick as an aketon but figure/fashioned like an civilian doublet. Sometimes with voiders attached. These are real tricky to spot since doublets with points was high fashion at the time, but i think they differ in how they are made structurally. Ill add my view on the whole topic..
And JUST to confuse things - TWO layers of arming clothes! Just a thought about " jupon " or " surcoats " that cover other armour: Plate or maille or a combination of both. Even in a form giving no extra protection wouldn't these make finding the chinks / vulnerable gaps between plates in the armour worn underneath more difficult ? Or even know exactly how well armoured one's opponent's was ? The whole idea of hiding the exact placement of weak points making it harder to aim at those weak points. So fashion was probably a reason for these and any extra protection a bonus ! Oh, in some cases a very thick gambison is obviously THE armour and not just something extra or decorative. Good thought, that was probably a dimension. Altho i think the main purpouse was heraldic for surcotts and in the case of the jupon to protect the armour from weather and grime when in field. You are great! This is a very cool thread. Sorry I have posted so infrequently lately but just back from a few day stay at the hospital and I feel (and in some aspects look) like I got beaten up by a group of drunken huns.The surgeons were good I am supposing they just had to stray me down while under general. Who knows. I think A-O all fall into three main catagories though I will end with perhaps a forth. You have the over plate/mail (no this is not plate-mail but and or) armour, example B and C (look heavier and have quilting lines) . This is hard to say how thick they were and fabric armour is not so commonly preserved. The black princes (most assume it is over armour as it is so decorated but I do not think that follow 100 percent as he was the heir to the throne, I assume his underwear was faily nice, possible decorated as well, so it could be under armour as well though very thick for that) is very, very thick. I have a friend from the Armouries who works with textile armoures and she said looking at it it could have been stand alone armour it was so thick but most probably was used in conjunction with plate armour. 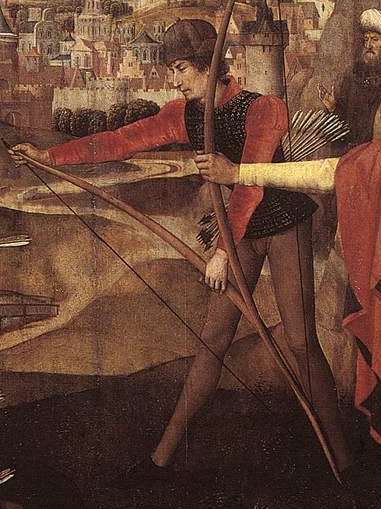 Some of the men are wearing unquilted fabric overtunics, likely over plate/mail armour as in some cases, F. for example looks like he would have armour under his fabric covering but it seems (no quilting lines) unpadded. 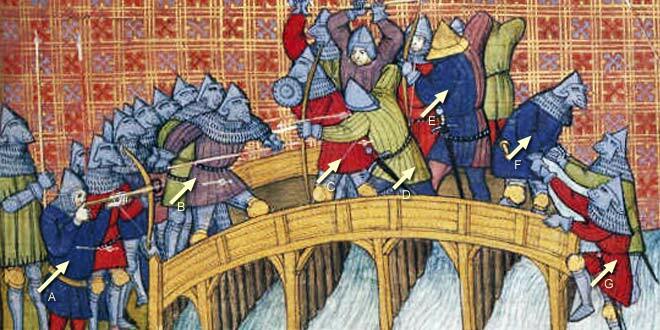 also padded defences w/out plate/mail armour under. D possibly. The garment has the lines of a quilted item and looks somewhat solid how the artist has it drawn. So there we have three forms of armour; worn alone, over or under plate/mail and an unquilted covering. These are termed all sorts of things. Some have taken aketon to be the under armour and gambeson the over armour (Blair, though he knows this is not accurate but just convenient, I agree). In the huge number of primary sources I go over in england aketon is very common in civic records (commissions of array, probate inventories, public records,etc.) aketon clearly is used in conjunction with 'plates' so I assume it is under as they in some cases are then given what I assume is uniforms. 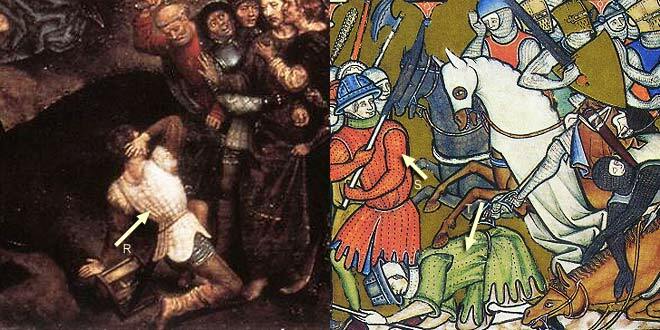 So aketon could be a stand alone garment as indicated in Edward II's minimum requirements for men at arms in the early 1320's but less than ten years later Edward III is requiring the aketon with 'plates' as minimum. Clearly the term has all sorts of uses and why not, the same garment perhaps could be used in multiple places. Jack is something that has been seen as a 15th and on garment but appears as a term earlier. It also has been come to be Identified with a many layers of linen or leather. Recent dissections of a 15th century jack indicate this was not always the case. Not only does this one not have the great number of layers as commonly stated but was also padded with untreated raw wool. In the end after years of looking and listening to many ideas on what terms to apply I have just figured that it actually makes it more difficult to understand what the original medieval texts are saying if we assign terms they used in many different cases to one specific mode. It really is not that bad. In the case above it becomes clear the aketon and ' plates' are used together. Whether worn under, over or alone the padded armours historic terms used are many and likely the same item will be called by diffeent names. The only real catagory I figure could be done would be the surcoat or supertunic, unpadded over armour, opposed to padded over armour. I admit I have adopted using some terms that Blair and others recommend, aketon for under armour, gambeson for over, jack for a defence that was used often alone in the 15th by common soldiers but in the end in their historic use they still shift and change so it is more for my own organisation. interesting thought. I do imagine it would though. it also could perhaps give a surface that would make getting a bit anywhere very difficult. Making a typology would help us discuss them for sure. The funny thing is the specialists all have decided on their own as it suits their studies. I find myself doing the same the more I read and it seems one term fits one catagory better. I will email my friend at the armouries and see if she has anything writted down like a rule of thumb and see what she says. Nice picture bye the way, the reenacters pages especially are great! One overly simplified way is to assume that if the wearer has much plate armor on the extremities, he would have a breast-plate and he would be wearing a jupon on top of it. A: might be a tunic, as Craig suggested. H is confusing. (a gambeson or arming coat). Is there away of knowing for sure? Likely not. So if you ask 10 people, you will get 15 opinions on what the various garments are. I'd rather label them with what they could be. The interesting thing about S is that it seems to have some sort of hard or soft collar. Would anybody else like to add input to this? Certainly you had layering of padded garments-mail-padded garments. An armorial treatise from the early fourteenth century talks about this, and a Welsh effigy depicts a padded gambeson-like garment worn over mail. 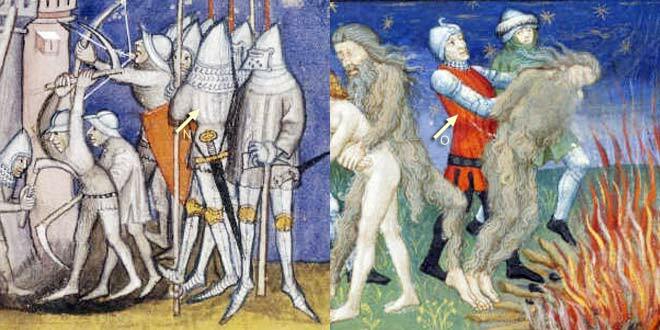 It is within the realm of possibility that medieval warriors wore more than one layer of padded garment. As for naming the garments - I tend not to be a purist on the matter. I agree that a garment specifically designed to be worn under plate with gussets of mail is an arming doublet, but I tend not to be so specific when it comes to other padded garments. Some of the terms seem interchangable in period. The medieval mind wasn't as exacting in terms of names as the modern mind tends to be. gambeson - a padded garment, usually quilted in vertical lines, worn over or under armour or used as a light armour on its own. aketon - a padded garment, similar to a gambeson (the differences aren't always clear) worn beneath armour or as its own defense. pourpoint - a general term for padded garments, usually used for a garment worn over armour or as a civilian garment. The term probably actually comes from "for points", which may alter the definition. jupon - a garment worn over armour in the 14th century, either plain or padded. Usually sleeveless, but the Black Prince's jupon bears short sleeves. jack - a quilted garment either filled with padding or made of several layers of fabric, sometimes lined with iron or horn plates or rarely mail. Worn as a defense by infantrymen by the 15th century. jazerant - a mail hauberk sandwiched between layers of padding. I am not trying to imply that these definitions are definitive; they are just my take on the issue. Many authors tend to use the terms rather interchangably, and you will often find that gambeson is often used as the most general term. Aketon A padded and quilted garment, usually of linen, worn under or instead of plate or mail. Arming Doublet Quilted garment worn under armour from the early fifteenth century, equipped with points to attach mail gussets and pieces of armour. Gambeson A quilted, skirted doublet of cloth often made of linen, stuffed with tow, wool, or grass. Worn by all classes either underneath a mail shirt, on top of it, or as a separate defence on its own. Jack A jacket or doublet of fence either of linen stuffed with tow or lined with small metal plates. 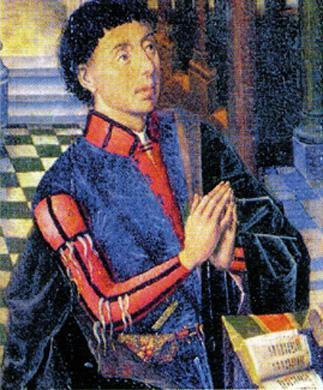 Jupon A tight-fitting garment, usually padded, and worn over armour from c1350-1410. Often used to display the wearer's arms. AKETON, ACTON, AUQUETON, GAMBESON, HACKETON, HAQUETON, WAMBAIS, WAMBESIUM, WAMS. A quilted garment much used as armor in the 12th and 13th centuries. 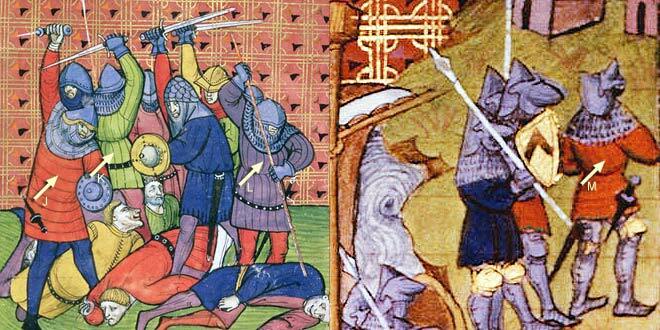 The knights wore it under their hauberks and it was the sole defense of the foot soldiers. When worn under armor it was sometimes without sleeves. ARMING DOUBLET A padded garment of some heavy material, usually leather, worn under armour to protect the person and ordinary clothes from stains and chafing. It was padded to act as a cushion to blows struck on the armor. When mail gusstes were worn to protect the joints they were fastened to the arming doublet; aiguilettes for holding the arm pieces in place were also attached to it. JACK Body armour worn by the rank and file in the 15th and 16th centuries. It was either a padded coat, or one interlined with mailplates or horn. Canvas garments pierced with small, round holes close together worked round with the buttonhole stitch, were also called jacks. JUPON, JUPEL, GIPON garment worn over armor in the 14th and 15th centuries. It was tight fitting, sleeveless and usually embroidered with the armorial ensign of the wearer. ffoulkes used the word as synonymous with the surcoat - Planche says that it was a different garment and was worn at a later period. POURPOINT A close fitting garment of leather, padded and decorated with needlework, worn under armor in the 16th and 17th centuries. Occasionally when heavily padded it was worn alone as light armor. There might be a few debatable details in Stone's definitions, but they do show the different terms used for similar garments. Does not aceton mean "a Centon" in translation to modern english of cotton? I thought that the specification of aceton where the textile they where made of! I could be in the totally wrong street here though. BTW I voted this topic as a spotlight topic. It could either refer to the fabric the shell is made of, or of the stuffing material (raw cotton or cotton wool). It is thought that the terms aketon, haqueton, and the like come from the Arabic word for "cotton". acton quilted soft armour, 14th century Ireland. aketon quilted form of soft-armour, from the Arabic word for "cotton". arming doublet padded garment worn beneath later medieval plate-armour, to which small pieces of mail could be laced to protect chinks in the plate-armour. gambeson medieval padded or felt garment normally worn beneath armour. gazerant form of mail armour contruction with integral padding and probably cloth covering. jack semi-rigid fabric-covered body armour of very small pieces of iron. jazerenc, jazerain padded and lined mail hauberk, 12-13th century Europe, based on the Arab-Islamic kazaghand from which the word originated. pourpoint quilted and perhaps sometimes scale lined form of soft armour. wambasia medieval padded or felt garment normally worn beneath armour, England. aketon (also acton, from the Spanish alcoton derived from Arabic al-qutum, "cotton") A plain quilted sleeveless garment worn under armor from at least the 12th century to the early 15th century. It ensured a better fit of protective pieces and also served as a shock absorber. Quite often it was worn as the sole body protection, mostly by warriors of inferior rank. Occasionally, aketons worn as an outer garment were decorated with appliqued ornaments. 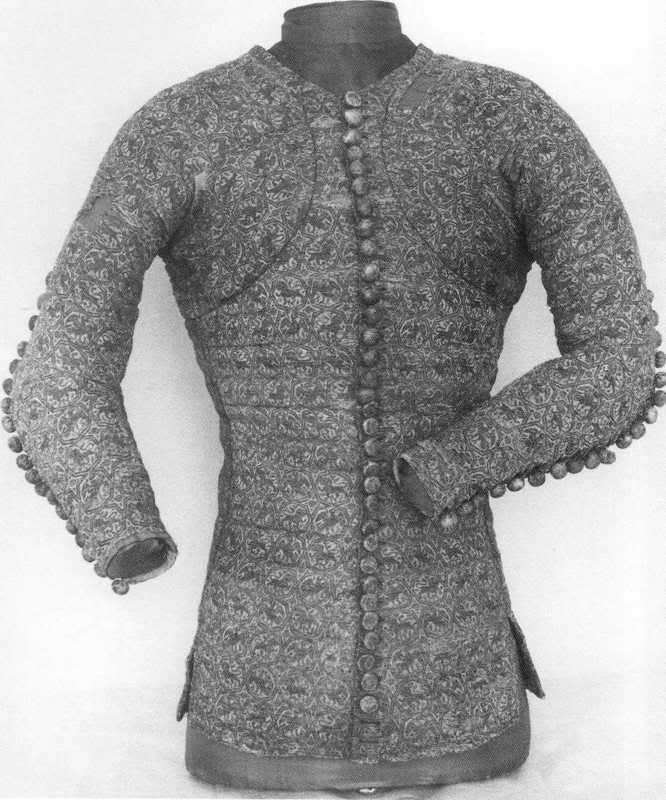 From the early 15th century, the function of the aketon as under-armour equipment was replaced by the ARMING DOUBLET. 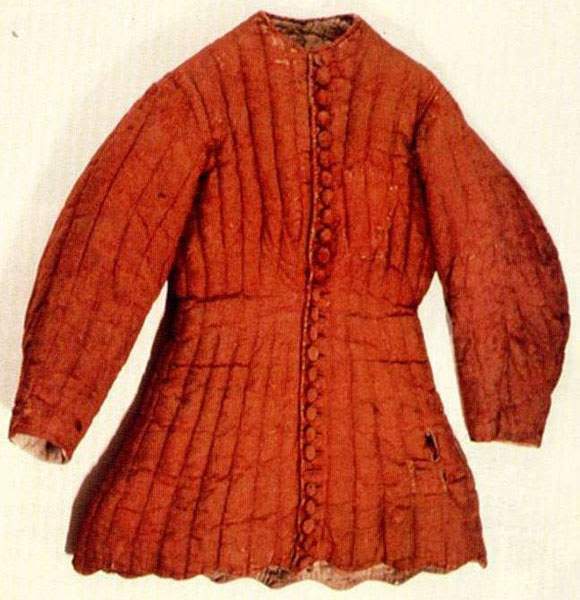 arming doublet A quilted garment with sleeves, armpits, and skirt covered with mail, worn in the 14th and 15th centuries under armour to give protection where plates or lames did not give an adequate defense. coat armour ...After the mid 14th century, coat armor was made in the form of a short, sleeveless garment with a small skirt that reached to just below the hips, tightly fitting the cuirass. When worn without armor, coat armor made of padded and quilted fabrics, with full sleeves and a skirt, could serve as protective equipment. Coat armor used with armor had openings laced on the back or sides, whereas independently worn surcoats were sometimes buttoned from top to bottom in the front, and embroidered with ornaments and coats of arms. gambeson A quilted garment used in the 12th to 14th centuries. Made of plain fabrics, it was worn under an armor and was, in fact, functionally identical with the AKETON. The gambeson might also be made of rich materials decorated with embroidered ornaments and coats of arms, in which instance it served either as a surcoat put on over armor (see COAT ARMOUR) or as an independent protective dress. jack Common soldier's armor worn during the 15th and 16th centuries, if not earlier, consisting of a canvas jacket with small overlapping iron plates fixed inside between layers of fabric by trellis-pattern stitches. It was, in fact, a simpler and less expensive version of the BRIGANDINE. 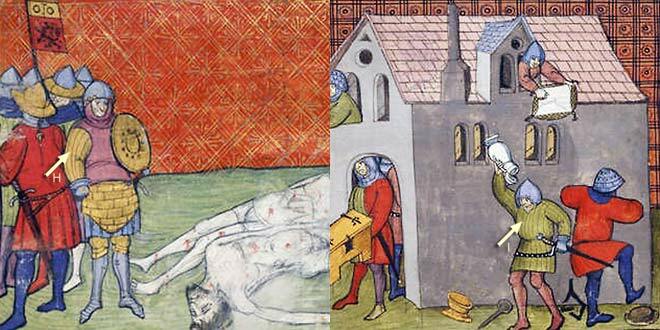 A similarly made protective garment of Mongolian origin was called KUYAK in medieval Russia. jazeran (or jazerant) An alternative term for the KAZAGHAND. kazaghand An Arabic word for a type of Oriental mail armor used in Turkey, Persia, and Arabia from the 11th century onward. It consisted of a mail shirt, cloth-lined and covered with good-quality fabric - often silk - which was sometimes colored, patterned, and padded. Although expensive, it must have been a popular type of armor because it was comfortable to wear and attractive in appearance. It was not durable, however; the cloth soon wore out, especially under conditions of war. Only a few examples are well preserved, one of which is in the Topkapi Sarayi Museum in Istanbul. This kazaghand has long sleeves, mitten-like extensions for the backs of the hands, small buttons with corresponding loops to close the center front and sleeves at the wrists, and two pocket-like patches for the attachment of cartridge clips across the top on each side of the breast. The term jazerant is a national name derived from kazaghand for the same type of mail armor. I'm not advocating one definition over the other for most of these terms; I just wanted to show the variety of terms used for these padded garments. I feel something relevant can be gleaned from each source. 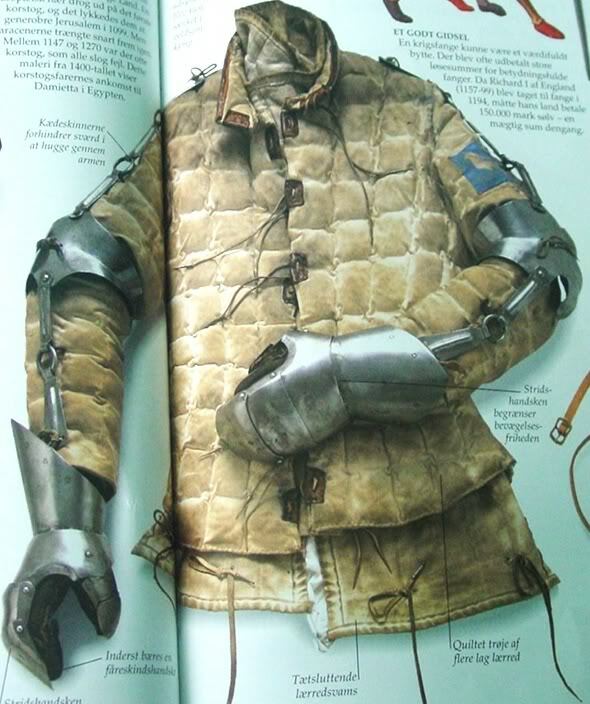 John Hewitt cites a few period examples in Ancient Armour and Weapons where gambeson is probably used in reference to a padded defense worn on its own. In The Armourer and His Craft, Charles ffoulkes presents a period mention of "jaques" as a garment of layers of linen. I think these terms might not be as specific as our modern minds would like, and the same term could cover different variations of the same general form of padded protection.